What does the average American civilian think of when the Gulf War is mentioned? Many things come to mind. Such as the fuzzy green nighttime images we all watched "live" on CNN, the Allies' dominance of the Iraqi military, and often the idea that this really wasn't a "war". After all, we were so technologically advanced and superiorly trained that this was nothing more then another training excercise. One thing is certain. What does not come to mind are the images of killing, gunfire and death, or the lasting emotional and physical damage imparted upon America's warriors. Even today, over 10 years after Operation Desert Storm, this popular misconception still spreads throughout the world, especially America, captivated by its "right-now", "what have you done for me lately" mindset. Only those who were in the desert or those who have taken the time to get to know veterans truly understand the nature of the beast that was Operation Desert Storm. Oftentimes people fail to realize that while our soldiers are highly trained and extremely effective war-makers they are still human people, like you and I, underneath the body armor and cloak of years of training and experience. Clearly America needs its eyes opened to the plight of the veterans of Operation Desert Storm, who did more then go "play" in the "sand-box". A Prayer at Rumayla is a fast-paced and hard-hitting novel about a young tanker in Desert Storm who finds that war in the desert was much more then just a stop along the way in the journey of life. The author uses the novel's main character, Chet Brown, as a mirror of his experiences. In the wars of the past, the goal of soldiers was to come home alive, plain and simple. For sure, the Gulf War veterans accomplished this goal. But in the age of more deadly chemical weapons, and an uncertain enemy, this needs to be re-evaluated. Chet arrives back in the States, and is greeted by warmth not received by Vietname veterans. However, things will never be the same. Spurned by his family, betrayed by his friends and lover, Chet faces a new world as a different person. Uncontrollable, and permanently scarred, Chet searches for the clues to what has gone wrong, what has changed and who he is now. 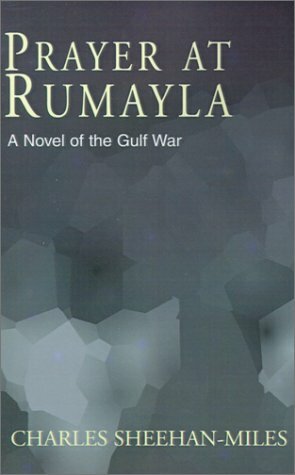 A Prayer at Rumayla is a riveting, hard-hitting account of the Gulf War that exposes the dirty underbelly of war this is not part of the popular perception. This book, told through the guise of fiction, is a must for anyone interested in the Gulf War, as it really happened. This book is a masterful blend of fact and riveting fiction that brings (recent) history to life, right in your mind, without boring the reader or dumbing down important information. This book is definitely a hard one to put down. Cover-to-cover, the author places the reader right with Chet. In his tank and in his thoughts, we are offered an up close look at the psyche of a warrior in America's TV war. This book is highly recommended and should be on the shelf of every military history fan. With military action ongoing around the world, and with the possibility of troops re-entering Iraq on the horizon, we must not forget the lessons that can be learned from our soldier's experiences during and after the Gulf War, A Prayer at Rumayla is a step in the right direction. As with the other book reviews here at Desert-Storm.com we also conducted a quick interview with the author to find out some information that you may be interested in. Q - Seeing as there has been much written about Desert-Storm and the surrounding events and times, what makes your book diffrent from other such writings? A - There are 2 things which I hope make A Prayer at Rumayla unique. First, unline the vast majority of the books published out there about war, I was there, as a combat soldier. The book reflects those experiences of what it was like on the ground, and not the Pentagon-filtered clean technological nothing, which was reported by CNN during the war. Second - virtually no one has written or even talked about what it was like to live with what happened, what it was like to come home from the war. A - I enlisted in the Army in the spring of 1990 and finished basic training the same week Iraq invaded Kuwait. Two weeks later I was in Saudi Arabia, assigned to 4th Battalion 64th Armor in the 24th Infantry Division. We spent most of the next several months in the Eastern Province, then invaded Iraq on February 24th, 1991. Participated in actions against the 26th RGFC Commando Brigade, many small incidents along Highway 8, then the final battle at Rumayla on March 2, 1991. During the war I was involved in an incident which was somewhat mimicked in the book, in which my platoon shot a number of Iraqis. Subsequent to that, in the fall of 1991, I filed for conscientious objector status, and was honorably discharged in September 1992. Since then I've been heavily involved with veterans issues, and I still serve on the Board of Directors of the National Gulf War Resource Center. Q - Bearing in mind the many issues that have come of the Gulf War (GWS, American globalism, etc). Would you fight the war again, and what should we have done differently? A - Our country's primary - only - interest in the Gulf is oil and money. I'd like to see us chop down some trees in Alaska and exploit the oil reserves in the Alaskan National Wildlife Refuge. In the long run, America needs to not be dependant on foreign oil, and our repeated wars in the Middle East are the result of that dependance. It's ironic - I tend to be what many would call a left-wing liberal type, but I'm all for exploiting ANWR - why fight foreign wars for natural resources we have just around the corner. I can't imagine that drilling for oil in Alaska would be less harmful to the environment than 500 burning oil wells in Kuwait. Would I fight again? I'm sure they wouldn't let me. That aside, it's hard to imagine us mobilizing hundreds of thousands of troops halfway around the world to defend a small, dictatorial monarchy. Seems kind of un-American to me. Except for oil and corporate profits. I enlisted to protect and defend the Constitution of the United States, not to defend corporate profits. Q - What is in the future for you? Can we expect more writing from you? A - Absolutely. I'm currently most of the way through my first draft of the next book, which focuses on the federal government overreaching its constitutional limits. The initial inspiration for the work came after Oklahoma City in 1995, but the vast majority has been since September 11. It's been a long time since I've been around, but I googled the book and wanted to drop line. I owe you Scott, and the other folks around here -- the book ended up doing very well, and it was thanks to your help. Thanks and I hope all is well!